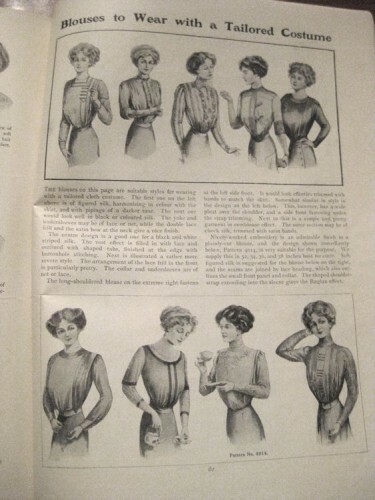 I’m afraid these images from the Girl’s Own Paper aren’t the best quality, but I’ve had a special request for blouse images from the 19teens. I’ve got a few more that I’ll show over the weekend. Why do they all look like they’ve stuffed a pillow down their front? And how to achieve such a tiny waist?! 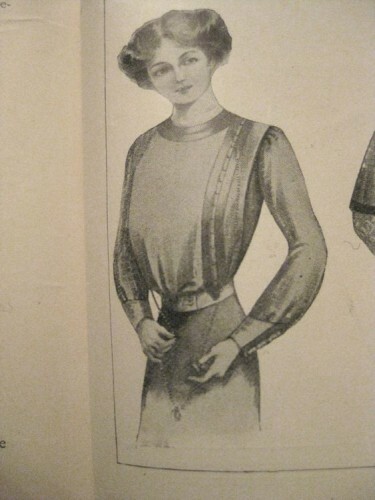 The pillow down the front (or pigeon breast) look was fashionable. 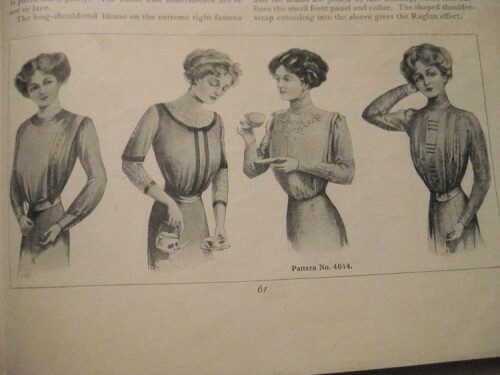 It was achieved by cutting the blouse baggy in front. If you look at the hips you can see that the waists are reasonably natural in proportion to the hips, but the shoulders are much wider. I doubt many women looked like that in reality; I’d classify this as the teens version of Photoshopped models. The one with the necklace looks to me like it’s foreshadowing ’20s styles. If you go back to those good wedding dress photos we were enjoying a wee while ago, you will see the real proportions. 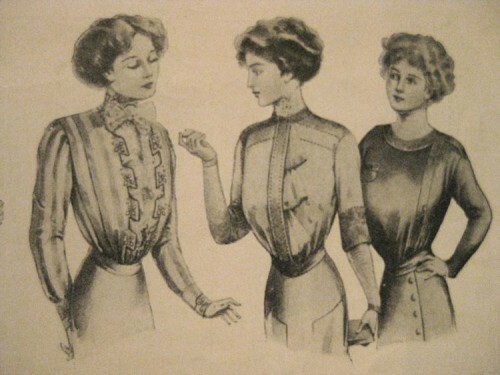 Waists were smaller, once. Not just mine! 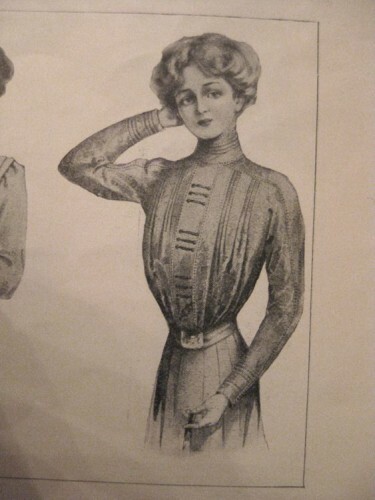 One of my great aunts (pre WWI) had an 18 inch waist. This was considered worth mentioning, but not exceptional. 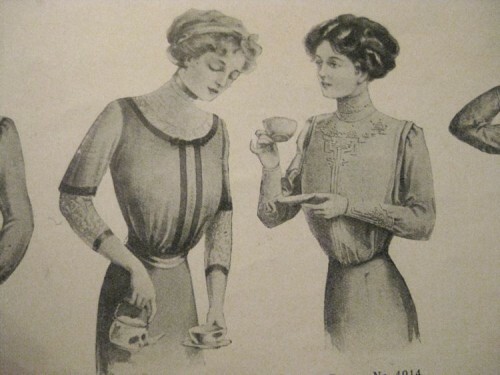 My objection to the pigeon front is that it looks so matronly – a monobosom, far too early. 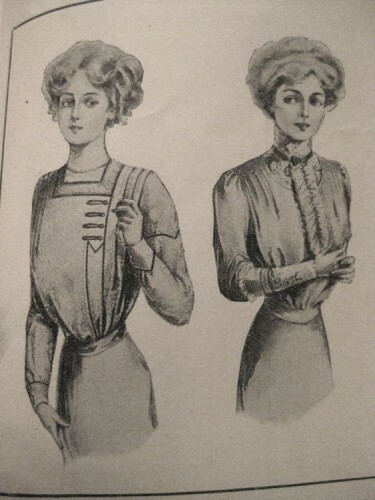 There’s several with distinct possibilities… I’m curious if you have any insights into how they kept their blouses tucked, especially with the extra high waistbands? 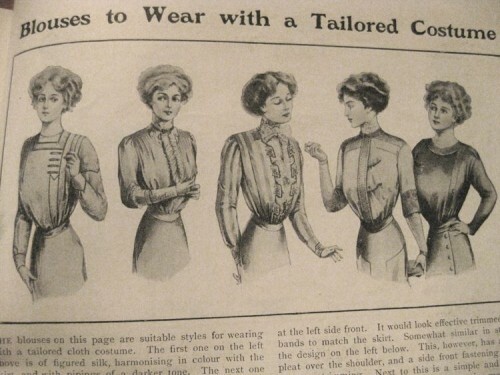 Was it entirely due to the fact they couldn’t bend at the waist, or did they commonly use some kind of system of snaps, buckles, or other fastenings? I’m experimenting with that kind of thing at the moment… Also testing swimsuit elastic inside the skirt waistband (no slippage) and etc.. I won’t know how it works out for a few weeks (lots of wearing weird stuff around the house to test it) but I’d love to know any of that kind of detail that you might have run across..
scroll down to the last box, and ask me if you need things translated. Oh, how fantastic! Thank you so much! Wow. I actually like most of these, and I’ve never been a fan of the pigeon breast look! But most of them work with simple embelishments and simple styles that would work on a different silhouette as well. That’s just what I was thinking! And we know from examples like Queen Maud that not everyone went for the more extreme silhouettes.